Can I still Call in, fax, or e-mail my order? Yes, you can. If you are more comfortable using your previous method of ordering, please do. It is not necessary but if you do you will be able to do more with our web site. You can track orders, save carts, keep an address book, and create wish lists. The address book is very helpful if you send to the same persons from year to year so you do not have to enter the information over and over again. If you add names to your address book you can then just select them under the Send To: option. Step 1 - Find the product(s) you would like, choose product options, and click [Add to Cart]. Step 2 - Click [View Cart] in the upper right corner. If every thing looks right click [Proceed to Checkout]. Step 3 - If you already have an account, click [Log in to your account]. If not skip to Step 5. Step 4 - Enter your log-in info. Step 5 - Fill in all fields, including Billing info, Shipping info, and Payment info. Enter any comments for your order if applicable, then click [Check out]. How do I send a gift to others? If you are sending to just one person that is not yourself, follow the steps above, placing their information in the ship to area. How do I send to multiple people? Create an account if you don't already have one. Otherwise log into your account. Having an account allows you to add addresses to your address book. Add addresses you would ship to so you can use them on current and future orders. 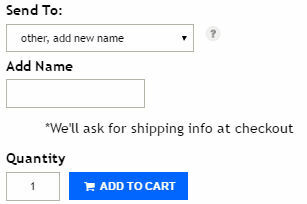 Prior to adding products to your cart you need to be sure to select any product options including an optional gift message and the tell us where to ship by selecting the name from your address book in the Send To: box. You can send to someone else without adding to your address book first by selecting "other, add new name" int the Send To: box. Then type in a name in the Add Name box. It will ask you for the address during the checkout. Unfortunately that name and address will not get added to your address book for future use at this time. Can I place an order for in-store pick up? Absolutely. In-store pick up is available for any orders placed with a shipping address in our zip code. If you would like to use our in-store pick up option, but do not have an address in our zip code, please put the first and last name of the person picking up the order, and Goodies address (2321 30th St. Spirit Lake, IA 51360) into the shipping info. In-store pick up orders are generally available within 24 hours of the order being placed. We believe in offering the same great price to all of our customers. Is my order secure? How do you protect my personal information? Our web site does NOT store credit card information and we do not share our account information with anyone. Our secure servers protect your information using advanced encryption techniques and firewall technology. For more information on our security practices, click the GeoTrust icon in the lower left corner. We send packages out Monday - Friday. During warm weather months we ship Monday - Wednesday unless we are confident your package will arrive without waiting over the weekend. Orders are processed on a first come, first served basis. Generally, orders placed before 1:00 PM go out that business day. Orders after 1:00 PM tend to go out on the next business day. These times are not guaranteed, but we do our best to get your order out in a timely manner. Most of our orders are shipped via USPS, and will arrive within 1-3 days. Consult this map (search 51360) for transit times. A few orders are shipped via FEDEX. What if I want to place an order to be shipped on a later date? All orders placed through the website are shipped ASAP. If you wish to have your order shipped at a later date, please specify a ship on, or arrive on date in the comments box in the checkout. We handle all international orders on a case-by-case basis. Please e-mail [email protected] with the products, quantities, and address for a shipping quote. What is Warm Weather Shipping? Our method of warm weather shipping is designed to get our temperature sensitive product safely to its destination. Your candy is packed in a larger box than normal to provide more room for insulation. We also include frozen gel packs to keep the temperature below the melting point of the product. Please allow the candy to come to room temperature before removing the plastic wrap to avoid condensation. How long will my candy keep? How should I store my candy after receiving my order? We recommend keeping our candies away from four things: Heat, Humidity, Strong odors, and Pets. Heat - We recommend storing candy between 60 and 70 degrees F.
Strong odors - Chocolate absorbs odors easily. Keep it away from flowers, perfumes, and other foods. Pets - Animals, especially dogs, are very good at finding our product. If you insist on refrigerating or freezing your candy, we recommend placing it in a plastic bag with as much air removed as possible. When removing, allow it to completely come to room temperature before opening to minimize condensation. Our only store is located at 2321 30th St. in Spirit Lake, IA 51360. Our store hours are 9 AM to 9 PM central time, and we are open year round, 7 days a week. We close four days a year: New Years Day, Easter Day, Thanksgiving Day, and Christmas Day.